I know what you’re thinking. Chickpeas? Sounds so worthy! But wait til you taste this. Garlicky, gingery, intense flavours. Creamy chickpeas. A sticky toffee-ish masala. Totally moreish. 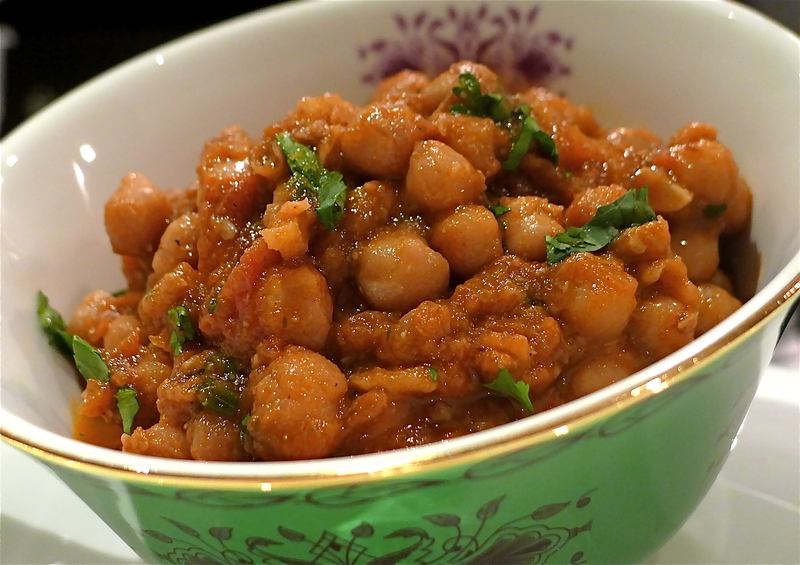 If you’re confident with using dried chickpeas, go for it. Use a cupful and soak them overnight. I’ve stuck with canned ones because life’s too short to wait for chickpeas to soak, and because I find some dried chickpeas soften better than others. 3 tips. Remember to hold your nerve and brown your onions properly. You must cook this uncovered on a medium-high heat for about an hour, to reduce all the liquid. And try to use decent tomatoes that look like they have some flavour, or boost the dish with some tomato puree. If you’re not a veggie, make this with a meat dish. But you must try it. Yoghurt and roti on standby! Heat the oil on medium in a deep sided pot. Add the onions and brown them, mixing occasionally. You want a deep golden-brown colour, not pale and not burnt. This may take 10 minutes or more. 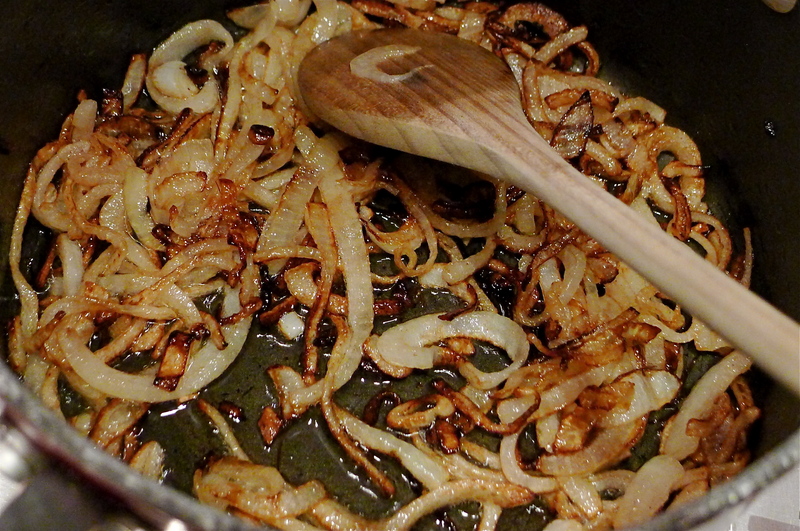 As the onions approach the right colour, add the chopped garlic and mix well. Add 3 mugs of water – remember to do it slowly, as the water will splutter. Add the drained chickpeas, the tomatoes, and if using, the tomato puree. Add the coriander, chilli, salt and ginger. If you’re not sure about amounts, add less. You can always put more in later. Mix well. Bring to the boil. Then lower the heat slightly to medium and leave uncovered to cook away vigorously for about an hour, stirring occasionally. It should be bubbling hard. Halfway through cooking, taste the liquid. Add more salt, chilli or coriander if required. Keep tasting. After around an hour, they should be ready. Almost all the liquid will have evaporated. 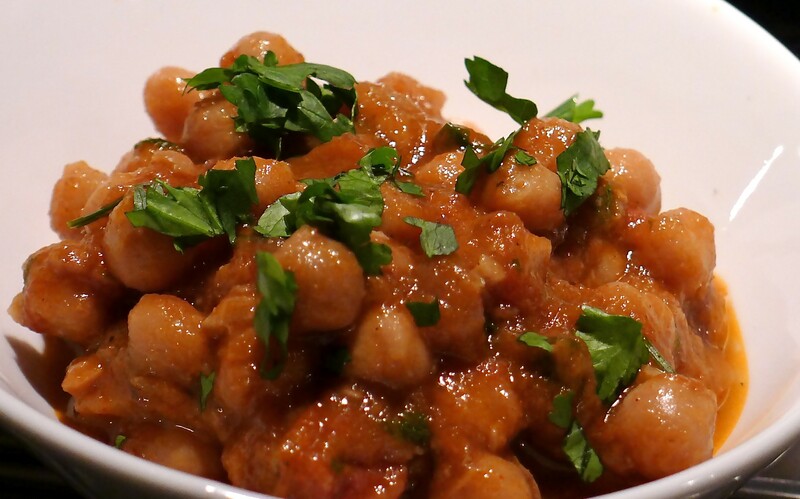 Some people like their chickpeas very dry, others with a lot of masala or sauce. I prefer the former. If it gets too dry for you, you can always loosen it up with a splash of water. If you like, add some finely chopped coriander and mix through off the heat. Serve. This may take a few attempts to get right – but it’s worth it. Enjoy! how many does this masala serve? Depends how greedy people are! 4-6 I would say..
Looks like a DELICIOUS, fast and healthy repice using one of my all-time favorite things! Chickpeas!! I am hoping I can find the garam masala. Do most stores have it? Garam Masala is really easy to find in the supermarket. However if you have a Chinese or India supermarket near you, the spices there are so much cheaper and in larger quantities. Most supermarkets do stock it. If they have the Natco or Raja brand, use them.